It is still winter here and will be for a while, most people are sick of it and I hate to say it but I am getting there, and am really starting to miss the open water. 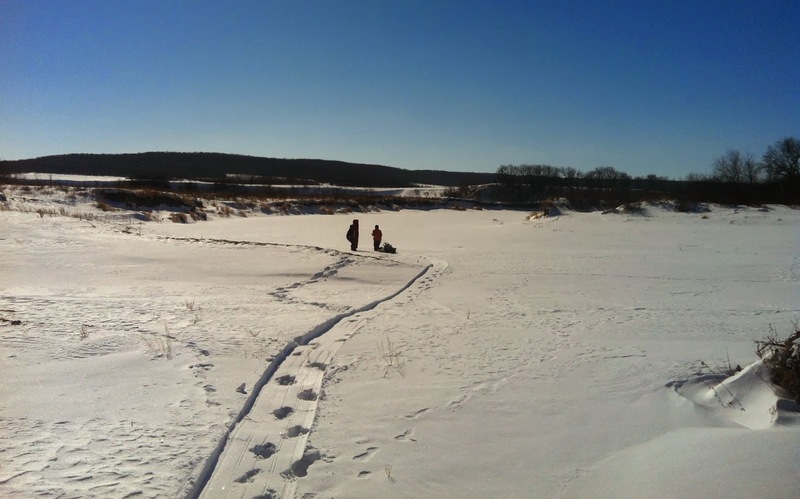 Ice fishing is one of the few activities that gets me through winter, a winter so harsh my wife hasn't been out once. Looking for something different and to get away from the crowds, this trip we went to one of my favorite open water rivers that gets minimal winter pressure. Oh the wind, I can count on one hand how many days this winter that have not had the wind howling one direction or another, a few occasions it has changed directions half a dozen times while we were out. As usual it was another windy day but we weren't deterred, work and life schedules dictate when we get to fish, not the weather. 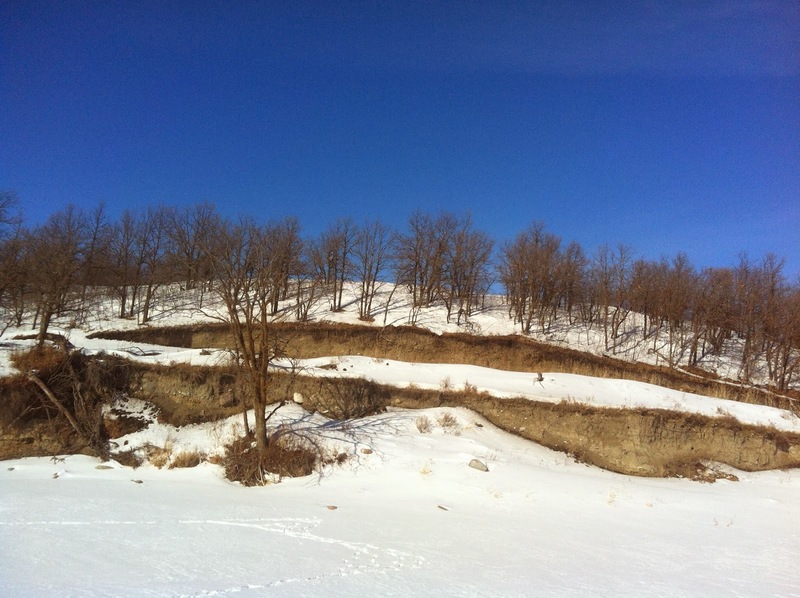 We were headed to a river that runs through a valley and knew there would be some walking through very deep snow to get to our desired spots, we also knew we were out for an adventure as much as we were to go fishing. safe we initially thought it was. 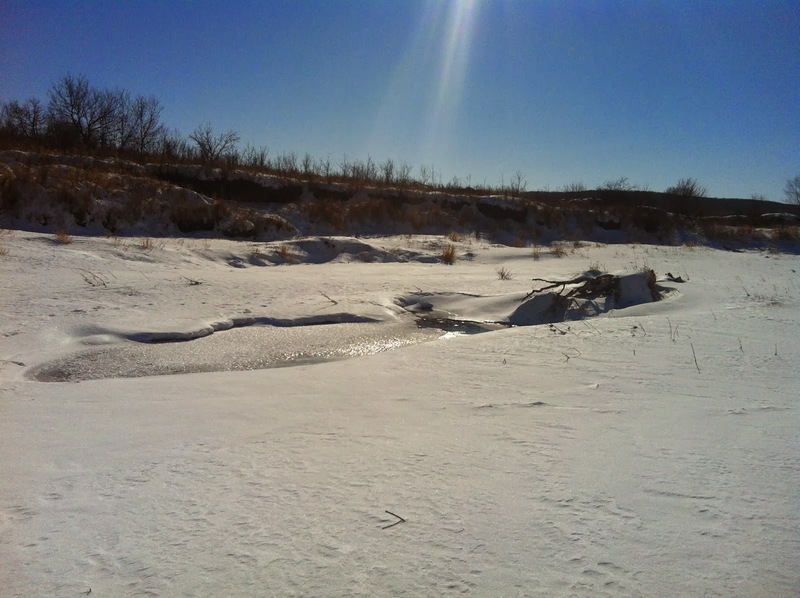 After spring run off on an average year this river in anywhere from one to twelve feet deep usually, we found two to three feet of ice and anywhere from one to six feet of water under it, sometimes drilling into the bottom. The first two spots we had in mind had four to seven feet of snow, there was no way we were going to dig through that so on we trekked. The scenery and peacefulness was exactly what I needed, despite the wind it was a beautiful day. After a grueling hike we made it to our next spot and started digging down to the ice, we were looking for the main channel and a deep pocket and eventually found it. Water scorpions and very small water beetles came flooding up some of the holes and were also clouding up our flasher screens. It would clear up every now and then and sometimes a mark would show up which would really get my heart racing knowing that we were on top of some fish. We missed a few bites and taps at our lures, even just one fish caught and released would make the day worth it. 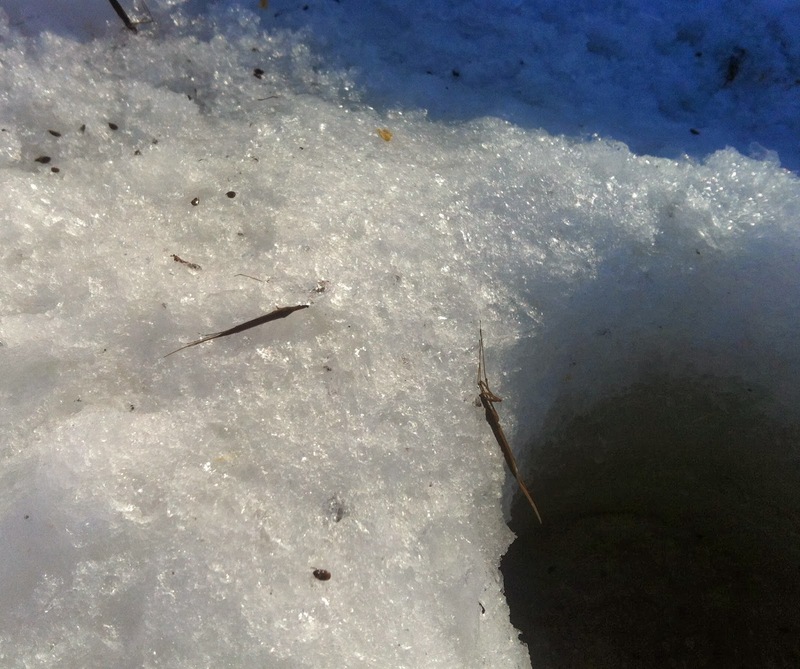 I ended up shoveling myself a wind break and hunkered down to focus at one of the more promising holes. Plenty of time to clear my head and enjoy the sites and that's exactly what I did. After about an hour we decided to pack up and push further to another potential spot, we came across some slush under the ice as we went, just enough excitement to get the blood flowing when you feel the initial sinking feeling of a nice crust breaking. 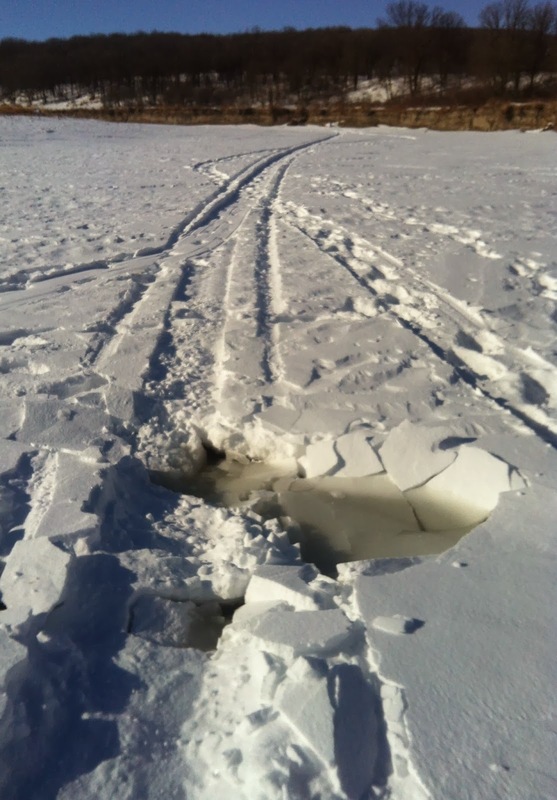 A few holes drilled at the next spot but we couldn't find more than two feet under the ice. A snowmobiler payed us a visit making some small talk, "Not a lot of fish around here" and "Sure picked a cold day to be out" followed by a lot of awkward silence and that was the only human we saw all afternoon, truthfully we could have gone without his visit. With a long hike back to our vehicle we decided to go keep fishing our previously drilled holes instead of hiking further. 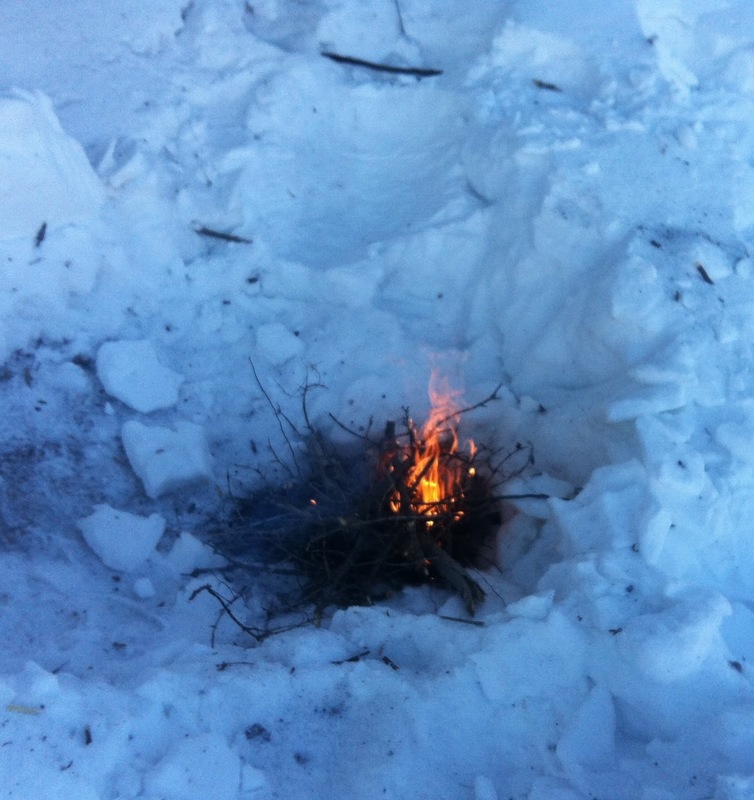 Once back at our spot I noticed some dead trees sticking out of the ice and thought a shore fire might be nice. Two flicks of a bic and half an envelope later and we had a nice little fire going long enough to warm some hands to get back to fishing. 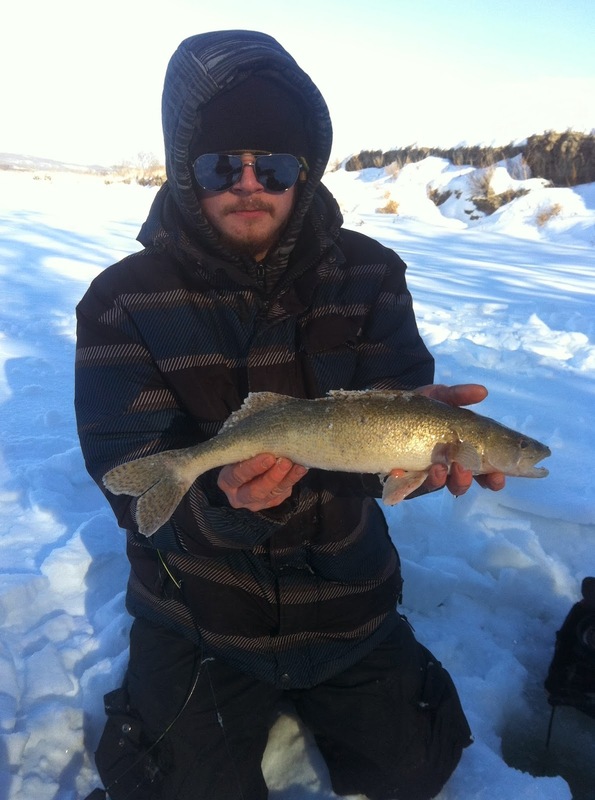 As Jay drilled a few more holes, Frodo had a line down and got a solid bite and hook set, before I knew it up came a 19 inch sauger. Biggest any of us had ever seen and a trophy by our provinces standards, a quick measurement and a few pictures and off it went to hopefully make it to spring and potentially spawn again. That right there made all the hard work, of which Jay does a good percentage of worth it. We fished on hoping for a few more, but all I got was a missed bite and a snagged lure. The day was cold and windy, miserable by most peoples standards, but we had a blast out on the ice and off of the couches.